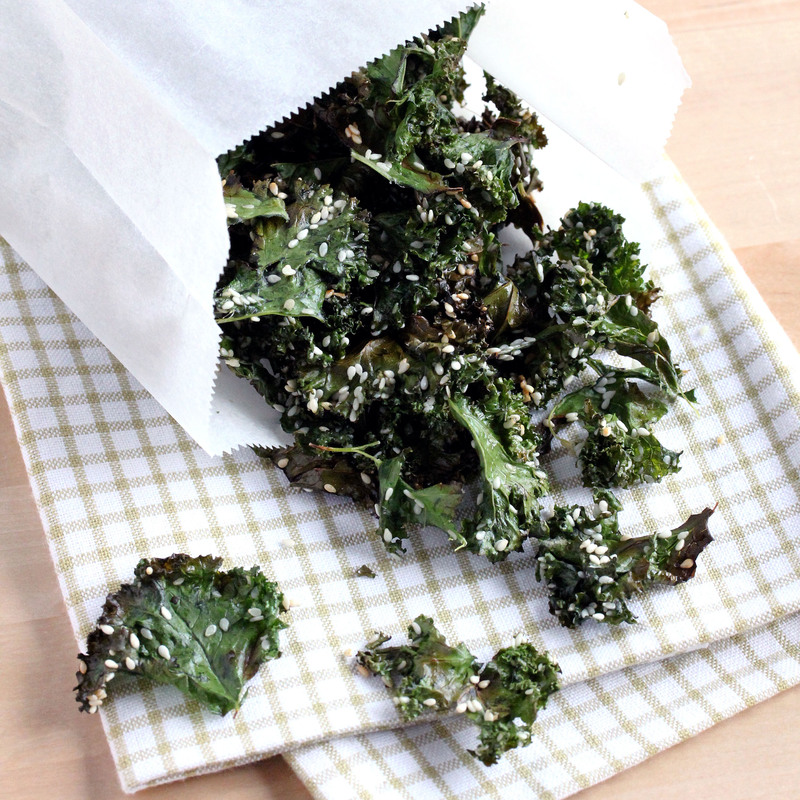 Sesame Mirin Kale Chips (Vegan) - Low-Carb, So Simple! - Gluten-Free, Sugar-Free Recipes with 5 Ingredients or Less | Low-Carb, So Simple! Rinse the kale leaves and pat dry with towel or paper. Tear the leaves into bite-size pieces. Discard the thick stem in the middle. Take the biggest bowl you have and put the pieces of kale leaves in there. Add the rest of the ingredients to the bowl and mix and massage thoroughly so that the pieces of leaves are covered everywhere with oil and spices. 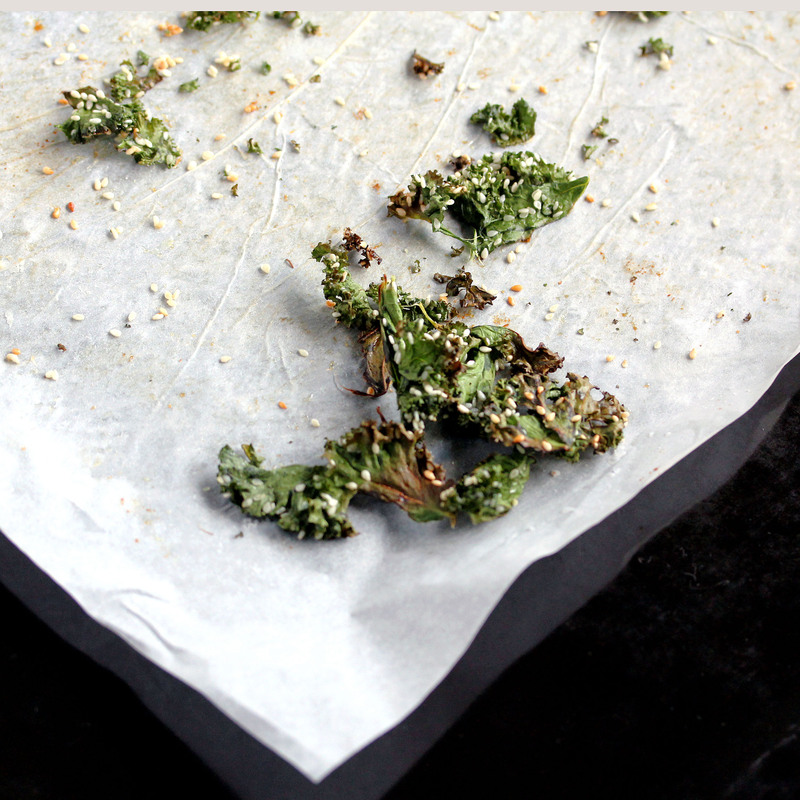 Spread the pieces of leaves on a baking sheet lined with parchment paper so that they touch each other as little as possible. Bake for 10-13 minutes, or until crispy and not too brown. Mixing the kale, spices and the oil should be done properly. Since kale leaves are pretty folded, you want to ensure that the oil and spices reach every nook and cranny. Luckily, kale leaves are tough, so you can rub and give proper massage to get everything mixed well without being afraid of breaking the kale. After 10 minutes baking, it’s worthwhile to take a peek frequently to ensure that the kale chips don’t get too brown. There can be a few brownish kale chips here and there, but the majority should be of bright green color. 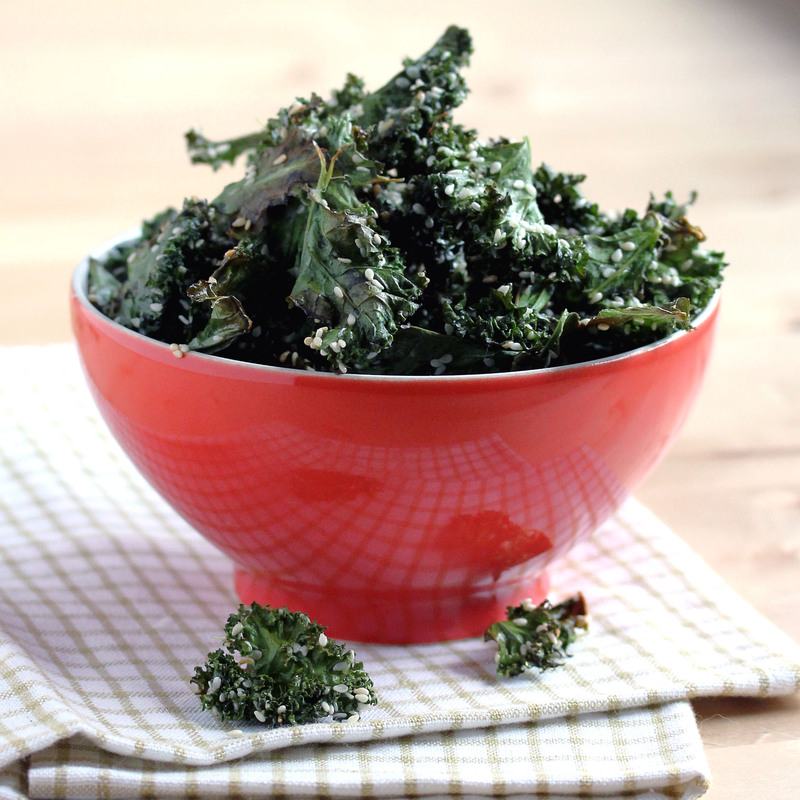 I love the salt and vinegar kale chips recipe from Elana Amsterdam. I’ve done the kale chips more than many times and they are extremely tasty. The recipe uses only 1 teaspoon oil, but as a big friend of natural fats I’ve used 2 tablespoons oil to give more crispiness and flavor. For a change, I wanted to try out different flavor and spice combinations and develop my own recipe. I pondered which flavors and spices go well together. I tried out for example mustard powder and finely grated Parmesan cheese, mirin and sesame seeds, garlic powder and ground espelette pepper. Parmesan tasted good or bad depending on my mood. My first espelette pepper experiment wasn’t utterly satisfactory. I used too much pepper, the kale chips were far too spicy for my taste even espelette pepper is definitely not the hottest one in the world. The combination of sesame seeds and mirin was incredible, those two ingredients just went so well together. Mirin gave a hint of sweetness and the sesame seeds gave crunchiness and nutty flavor. So great with kale! I also tried different fats: organic extra virgin olive oil, melted organic extra virgin coconut oil and melted organic butter. I found the flavor of melted butter to go well for example with garlic powder, but with mirin and sesame seeds the melted organic extra virgin coconut oil was definitely the best tasting fat. For fat, you can substitute melted butter or extra virgin olive oil for coconut oil. 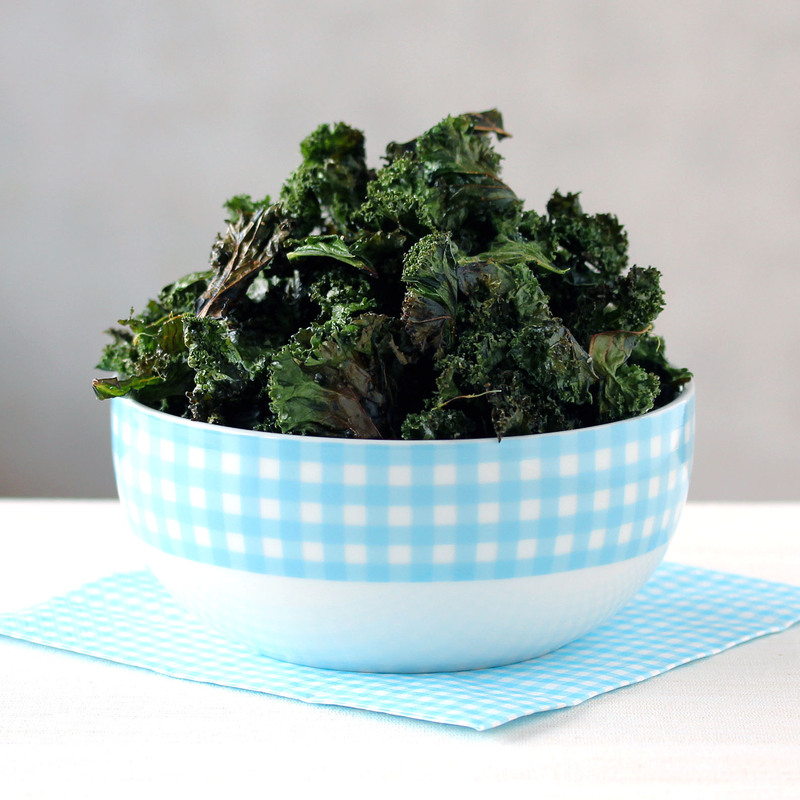 I’ve never seen a recipe using melted butter when making kale chips, but I tried it and it was very tasty. for fat: 2 tablespoons melted organic butter; for spices: 1/2–1 teaspoon organic garlic powder, 1/2 teaspoon unrefined sea salt. Megan, they are definitely worth trying! The beauty of kale chips is that you can vary them very easily and use your favorite spices and what you have in the pantry.